I thought I lost this recipe, and I panicked. I don't know about you, but when I panic, I drink alcohol. So anyway, 3 glasses of wine later, I finally calmed down and found this lovely recipe in the recipe box where it was probably hiding all along, and I decided, if I send it out into the ethersphere, maybe I won't lose it again. 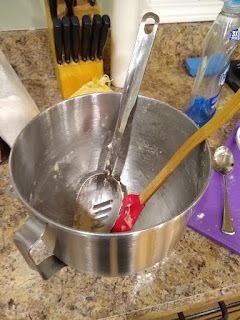 using cookie scoop or spoon, scoop out balls of dough. Roll in sugar and squish onto cookie sheets. Leave room as they spread a bit. Bake 10 minutes or so, when done, they'll be a bit crinkly on top, but won't change color since already brown. Let cool on sheet 5 minutes, remove to cooling rack. Thank you to the person who posted this on the internet 10 years ago and I found it. If I could find it again, I would credit you with honors, but I didn't copy the webpage, just the recipe. Pictures tomorrow, when I actually bake the darn things. This was the first cookie I baked for my mother after I was diagnosed celiac. And she ate it, and told me, well, if you can eat cookies as good as that, celiac can't be all that bad.